Have a research question? Need help using the Archives? Review our frequently asked questions. If you can't find your answer, then ask us! How can I find out if the Archives has information on an artist or artwork? Our website features a robust collections search that allows users to explore all of our holdings. There you can narrow your results by record type, names, topics, and more. To search the full website—including blog posts and other content—you can use the global search box located in our main menu. Each collection is different. The description on this website should indicate whether part or all of the collection has been scanned and is available online, or whether it is available on microfilm. All Online: Fully Digitized Collections can be viewed wholly online, arranged by box and folder, just as you would find them in our reading room. Microfilm: You may use microfilmed collections at the Archives’ research centers in Washington, DC or New York City, or at one of four affiliated research centers around the country. For details, see Visit a Research Center. If you cannot visit a research center, ask your school or public librarian to borrow the microfilm from us. Direct your librarian to: www.aaa.si.edu/services/interlibrary-loan. Partly Online: In the Search and Browse interface, you can narrow your results to documents and records which have been digitized and individually described. Original Materials: Use of collections that have not been microfilmed or digitized requires a visit to our reading room in Washington, D.C. Space is limited, so please submit your request as far in advance of your planned visit as possible. To request a reading room appointment, click on the “Reading Room” button on the collection page, under “Make a Request.” If you do not have a research request system account, please choose “First Time Users” on the login page. Once you have registered, you may review your requests for reading room appointments by logging into your research account at https://aeon.aaa.si.edu. How can I access an oral history interview? Interviews conducted as part of the Archives of American Art’s Oral History Program can be accessed by filtering on "Oral Histories" in the Search and Browse interface. In addition, the Archives has a number of interviews that were conducted by someone not affiliated with the Archives and later donated to us. The section called “How to Use this Collection” located in the Oral History record explains the options for access. Each interview in our collections has a summary description on this website, accompanied by a transcript when available. Complete audio recordings of interviews are not currently available online; however, some interviews do include MP3 audio excerpts. Complete audio recordings may be available for in-person listening, by appointment, at the Archives’ Washington, D.C. Research Center. Excerpts from interviews can be made available for use in publications and exhibitions pending approval. Polices, procedures and fee information for reproductions of audio excerpts are available on our Rights and Reproductions page. Can you tell me how much an artwork or archival document is worth? No, we are not permitted to give appraisals nor advise you on how much an object or collection may be worth. We recommend you consult the guide to Researching Your Art (opens in a new window), from the Smithsonian American Art Museum. How may I donate papers or archival records to the Archives? You can see a list of the types of materials we are looking for at Donating Papers to the Archives of American Art, as well as information on how to get in touch with the curatorial staff. How do I cite microfilm from the Archives’ collections? If owned by the Archives: Collection name, Archives of American Art, Smithsonian Institution. [Microfilm reel numbers]. If owned by another organization: Collection name. Owned by [Organization name]; microfilmed by the Archives of American Art, Smithsonian Institution. [Microfilm reel numbers]. How do I get permission to publish documents or images? For detailed instructions as well as reproduction fees, see Rights and Reproductions. Does the Archives of American Art lend out original documents for exhibitions? Yes, we have an active program of loaning documents to other institutions. See Borrowing for Exhibitions. Can I use original audio from the Archives' Oral History Program for a publication or exhibition? Excerpts of interviews can be made available for use in publications and exhibitions pending approval. Policies, procedures and fee information are available at Rights and Reproductions. How do I access the catalog? This website includes much of the Archives’ collection information found in the shared Smithsonian research catalog while additionally providing full-text search capabilities within our archival finding aids and access to individually cataloged images and documents. If you require the precision of a catalog search, you can find all of the Archives of American Art's records plus other Smithsonian resources in the Smithsonian Institution's Archives, Manuscripts and Photographs Catalog (SIRIS, opens in a new window). Does the Archives do Interlibrary Loans? 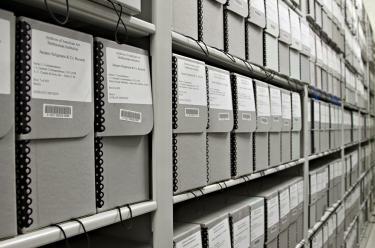 Yes, the Archives lends microfilm and oral history transcripts through Interlibrary Loan. Researchers must ask their library to fill out the Interlibrary Loan Form on their behalf. Lent materials are for in-library use only. Microfilm requests are limited to 8 reels. Microfilm and transcripts are sent via U.S. Postal Service. The due date for the return of materials is one month from the date shipped. A two-week renewal may be granted if the Archives receives your renewal request before the due date. There is no charge for this service. Copyright laws apply. If you have questions, you may contact the ILL Coordinator at 202-633-7950 or Ask a Reference Question. Do you have documentation related to digitization or other initiatives that you can share? We have posted some internal procedures and guidelines to serve as reference points on the Internal Procedures and Guidelines page. If you have questions about a specific initiative, technology, or practice, please feel free to Contact Us. Staff from the Archives of American Art have been active participants in the Library, Archives and Museum communities for many years, and we enjoy sharing information and discussing ideas with our colleagues. We're here to help! Select a topic from the options above, and we'll help you find the information you are looking for or connect you with our Reference Services staff.